Another render featuring my U.S.S. Resurrection model, but with registries of the Enterprise-A. As the image suggests, the Enterprise A is back in service, refitted with state of the art tech, and Starfleet left her registry alone. "my friends. we've come home." < Captain James T Kirk. Thanks for the endearing comment. Daihak, I love your take on the refit Enterprise. However, I was wondering if you'd be willing to do my take on the refit Enterprise. I know those engines. They're by WickedZombie. I used to use his ships and parts for kitbashing during my early days. I've been meaning to get back into the 3D modeling game. The secondary hull on your ship would be a little tricky for me on the front end. The saucer and bridge would be easy, and I know I can pull off the impulse engines. The neck, I've had moderate luck with a refit Connie neck. As for the nacelles, I want them to match the rest of the ship colorwise, and have the fins on the back be black. I want this to look as much like an second phase refit as possible; while at the same time keeping the overall look. now for the full story behind my refit Enterprise. You already know how it came to be in the real world; but in my Star Trek universe, it comes from an parallel reality. In that reality, Starfleet is much more advanced technologically; as they are able to send out temporal agents to observe and the different realities that are interconnected with their own. When they came across the prime timeline by accident, and the JJ verse respectively; they then decided to build an refit Enterprise that combined elements from all 3 Enterprises into one design. They then called this design the Mark II. About a year after it was built; Starfleet gave command of this ship to none other than Jamie Tiberia Kirk, only grandchild and namesake of legendary Starfleet Captain; James Tiberius Kirk. There are those who would say, in her days at the academy; that besides being an mirror double for her famous grandfather, that she was just like him in personality and actions. That suits her just fine; as he was her hero growing up. However, unlike him; she never had to cheat the Kobyashi Maru, as she beat it by her own merits and creativity. Once Jamie took command of the Enterprise; the ship flourished, and the crew became loyal to her; like an extended family of sorts. However; five years after her initial refit, she was recalled to the San Francisco Fleet yards above Earth once more; where she was originally built, to receive a major refit to her nacelles and deflector dish; as Starfleet had just finished building the prototypes to both systems and wanted to use the Enterprise as an testbed. The dish itself isn't a problem, it's the area right behind it. The contours and cuts in the hull. As for textures, I wouldn't be able to do those. I'd need someone else to map the ship and texture it for me. and what did you think about My Enterprise's history? I like the spying on alternate timelines element. I wonder how that would affect their own development. Makes me wonder what condition Starfleet would be in for first contact with the Borg. well; since this is an more advanced reality, they would use certain elements from each reality and combine them into one design; but they would outright steal from the other realities. if you saw THE ONE with Jet Li and Jason Statham, or Minority Report; then let me put it to you this way, this reality would be the equivalent of an Temporal Prime Directive Enforcement Bureau for Starfleet. In other words;they are Starfleet's Quantum Timeline Guardians. if you saw the episodes of Voyager that dealt with Captain Braxton, and his time travel schemes; then know this, the USS Relativity only monitors the timeline for the Prime reality. These other guys however; monitor EVERY known reality that has either an version of Starfleet, or the Terran Empire, and they go out to make sure no drastic changes are made to any of the timelines they monitor. Reminds me a little of the DTI books. Have you read them? Funny thing is the enterprise NX-1 aka the original looked more modern than enterprise A that came 100 years after it. I guess progress sometimes has to look like it was going backwards in order to go forward? I like the lines and the proportions of all the components to each other. I've been thinking of making my own re-imagined TOS Connie, and the thoughts I've had are very much like this design. Looks like great minds do think alike. Beautiful return of a Grand Lady! 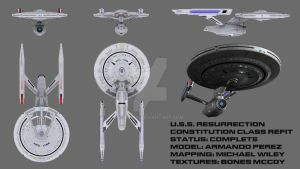 I will ALWAYS love the Constitution Refit and really coll how you put 24th century tech into her! Yes I believe they SHOULD have the same thing to her during the Dominion War! The Enterprsie B was said to have been missing in action. I made story where my OC was the Captain of the Eneterprise-B and she was able to return to the Alpha quadrant 75 years later! The back story for the Resurrection refit of the Constitution puts her in the early 25th century. I have been toying with a Dom War refit of the class, but there have been many that I've seen. OMG this is super epic!!! You've really poured the attention and work into this vessel, and it shows. Many thanks. There are other views of this ship on here, just not all with the Enterprise A registries. Wow, that's killer. I dig that, seriously. Always a comfort knowing the "A" is still around and kicking! I wonder if the Constitution is still around also? Hmmm....interesting thought. Might have to make sure she is. So the Ferengi are selling surplus Mirandas now I see. So long as they stay away from the Enforcer, there shall be no trouble. Then again, the last time they dealt with me, they added a new rule of acquisition, "Stay away from the mad man at all costs." U.S.S. Enforcer, my Miranda Refit. She's still a WIP, but you can see her in my gallery. I'm look at her now....sweet! The next Star Trek movie should have this Enterprise-A in it, love it, great job! Thanks for the links. Enterprise-A has always been my favorite Enterprise and the version I can picture flying side by side with Enterprise-E.
:-D Glad you liked it. Sometimes I wonder how future history would have gone if they rechristened the Excelsior USS Enterprise, NCC-1701-A. Hmm...interesting concept. I find it intriguing. You should have it revealing itself just as the Excelsior drops out of veiw like in TVH. I should have. In fact, I was thinking about that movie when I made this render. Nice work. If you don't mind me being a nitpick, I'd just like to say it would've been nice to have a lot more light (like the bright floodlights you'd get in spacedock scenes); other than that, though, it looks great. I agree about the lighting. I tried, but since I'm not very good at lighting, I couldn't get that floodlight effect to look right, so I just settled on this.